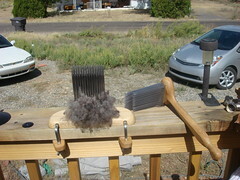 My new comb and hackle set. Love love love this! I spent several hours yesterday, and maybe an hour today, combing a *very* dirty portion of a Shetland fleece (pics are elsewhere in my Flickr account) and got a bulk paper box half full of very lovely, very CLEAN ‘birdsnests’ that are ready to spin. I hand spun and hand dyed some yarn to embroider flowers around the neck band, cuffs, and hip band but now that I’m finished I’m having panicky second thoughts. I don’t want to make it ugly, but it’s definitely too plain as it is. If the picture doesn’t show up, just click on the link, it will take you to my Flickr page….I haven’t been able to use the image linking widget since flickr changed their page — it’s supposed to be easier, but it’s not. Well, the San Marzano and Serpent of Sicily have been successes! Squash bugs no where to be seen anywhere near these plants, and they are producing like gangbusters. Not quite on the level of zucchini, but good enough for me. This is about the average size of these things…I should probably pick them when they’re a little smaller; the skin is tough enough that they need to be treated like a winter squash at this size. 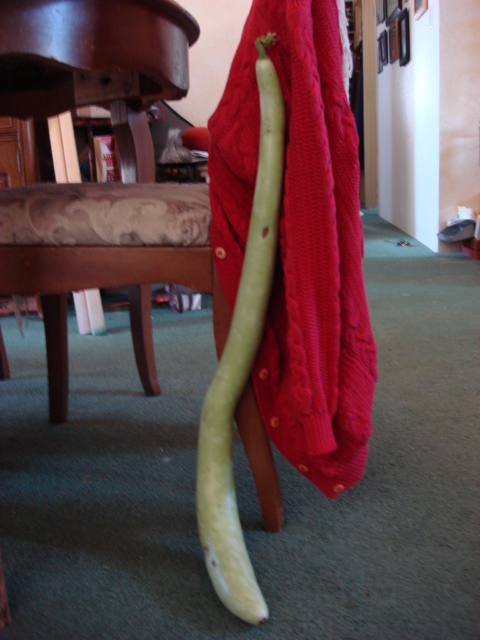 But, much like a zucchini, you can look at them one morning and they’re just little bitty…and the next morning they’re three feet long! They taste like a cross between a zucchini and a cucumber, we haven’t tried frying them yet to see what that tastes like. The San Marzano’s are a yellow squash with warty skin. They too, get a tough outer skin if you let them get too big (or let them sit on the counter too long) but the taste is sweet and mild, and they will be an excellent substitute for zucchini in my holiday baking. I have been shredding and freezing all of the San Marzanos, and shredded two of the Serpents today. I left the biggest one for Mr. TF to see when he gets home this afternoon. I’ve only gotten 5 lbs of Armenian cucumbers and those are in a dill brine on the counter. Green beans were a bust, yellow beans have produced well but late in the season, so still a very small harvest. Lima beans have done extremely well, and I will definitely expand my plantings of those next year — with the collard greens and some bacon they will make excellent winter soup! The chickens are producing at best, one egg a day between the four of them. I have orders for eggs coming out my ears, and can’t fill any of them because the hens are on strike, and I don’t know why. They get enough to eat, they get greens, their water is changed regularly, the coop is clean and the nest box is clean. Tomatoes are also a disappointment. I’m so glad I bought that 100 lbs of tomatoes from the coop earlier this year, or we wouldn’t have any sauce put up at all. The potato plants died back in the heat, and I can’t dig to see if I have any potatoes until the collard greens die back. I haven’t checked on the yams yet either. I feel like this year has been one giant failure for the most part. Between working and school, there just isn’t enough time for all I need to get done around here. We really do depend on the garden for a lot of our vegetable needs, and I am seriously stressed by the fact that we will have to buy lots of stuff we were able to grow in years past. That’s all for now, time to sauce the tomatoes I blanched now that they’re cooled off. Maybe two jars worth?